When Peter Neill founded Red Dot Chartered Accountants in 2013, Quentin James Design were tasked with creating a fresh, eye-catching accountant logo design and corporate identity for the Blackpool based firm. Making full use of the new logo design and branding we also designed a clean, simple, professional letterhead and stationery set for the new company. In early 2013, resident studio manager and twitter guard dog Huxley, our Tibetan Terrier, finally earned his keep. Huxley brought in his first client – Red Dot Chartered Accountants – a newly formed accountancy company based in Preston. Having discovered our dynamic team online, Red Dot founder Peter Neill decided that we were the right design agency to help him launch his new business. We were immediately commissioned to create a fresh identity and accountant logo design for the new start-up. Once the new accountant logo design was complete we created a new letterhead design, and some promotional pop-up banners. The Red Dot identity needed to be professional, bold but slightly playful. We ultimately portrayed these characteristics utilising clean, classical typography, mixed with strong, vibrant colours and created a logo design with a twist. The logo is a large capital letter ‘R’ made up of many small circles and is based on the classical font Baskerville. This ‘R’ is contained within a large ‘Red Dot’, a further play on the company name. The choice of font and the typography was key to the success of the accountant logo design. The font had to convey experience and reliability, so a classical serif was a solid choice. The font also had to accommodate the concept for the logo design and offer flexibility throughout the rest of the branding. We then applied the new logo to a letterhead design which drew on the aforementioned qualities and was printed on a high quality recycled, bright white stock successfully re-enforcing the company’s attention to detail. 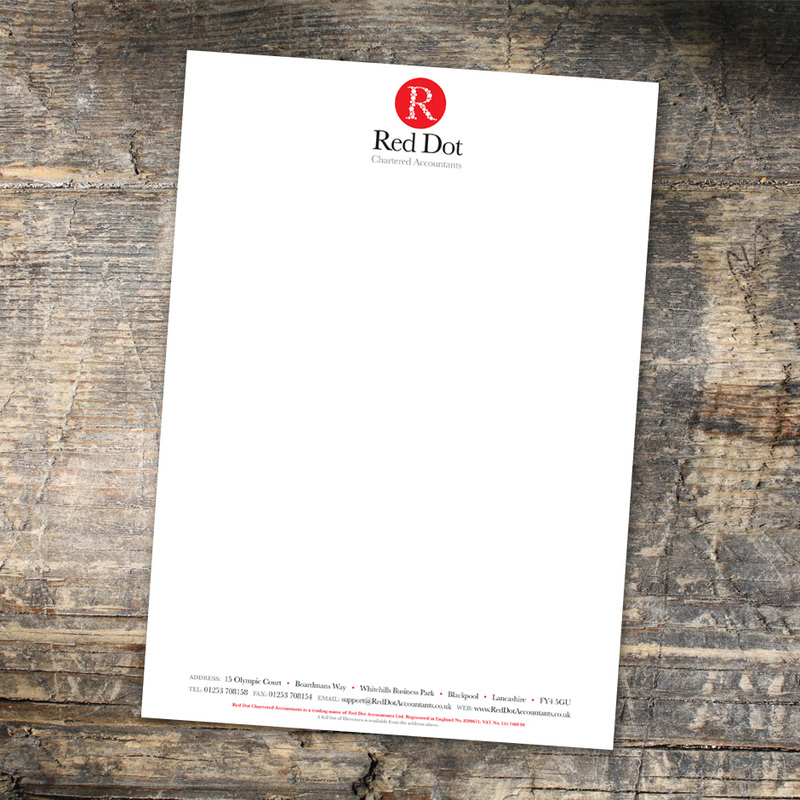 We handled the print for the letterheads using our network of trusted suppliers to get the best quality and price for Red Dot. We have a number of specialist print suppliers, whom we work with on a regular basis, in our network of suppliers which we have built up since 1998. Our decades of pre-press experience gives us the ability to quickly identify the right print supplier for each job.